The model will be released in 130 weekly issues, with full instructions on how to build. The first magazine costs £1.99, the second £4.99 and the subsequent 128 issues @ £8.99 each. The total cost of the model when finished will be in the region of £1150.00. The model represents RM857 (WLT857) on route 11 to Liverpool Street. The website states: "Made of durable materials and including working elements such as headlights, your model is the ultimate celebration of a classic design. 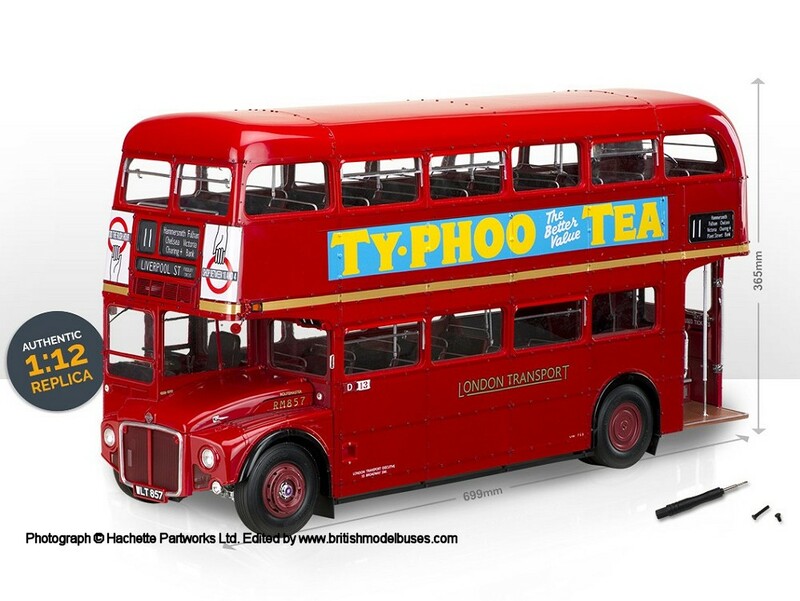 Careful attention to detail has been paid to ensure your model is as close as possible to an exact replica of the original 1966 Routemaster RM 857, plus no glue is needed and parts are pre-painted making it easy-to-build, even if you have no modelling expertise". The website lists the benefits of subscribing to the series "Each month you will receive 4 issues delivered to your door with free P&P. Each issue costs £8.99, with the exception of issue 1 at £1.99 and issue 2 at £4.99. As part of your subscription benefits, one of your issues in your first delivery will be FREE and you will also receive 5 FREE gifts during the course of your collection". After much deliberation and soul searching, I decided to subscribe to the series and will photographing each weeks magazine instructions and construction to show the complete build from start to finish. I will also feature each of the free gifts that you receive as a subscriber which are featured on the website. I have shown below, the real RM857 which I photographed at the North Weald Bus Rally on 21 June 2015, a photograph from the Hachette Partworks website and a couple of photographs of magazine issue 1 which I purchased from WH Smith to see what it was like. Photographs taken by me of the magazine pages are purely to illustrate the build stages, so that the entire process can be followed from the start to the completed model. The copyright of Hachette Partworks is acknowledged.